Blog Who are Tarsiers ? We chose Tarsier Sanctuary, located in a forest in an area of ​​10 hectares between the towns of Corella and Sikatuna , because this is where tarsiers live in the wild. They are free to do what they like, even to leave the territory of the reserve, which some of them do at night. Center staff only controls their number, treats and feeds them, every morning makes bypassing in search of their current location. Tarsiers are nocturnal animals and in the daytime are practically inactive.Usually they sit in one place for the whole day. The ones found in the morning will be shown to the tourists that day. Only one hectare of the territory is allocated for the visitors. So every time you need to hope that this day there will be more tarsiers, and they will be closer. But there is no guarantee. We’ve seen only three. One was close enough so that we could take a good look at him and take a picture. And this one is enough to be assured that we did not come in vain. Incredibly huge eyes and facial expressions can not leave anyone indifferent! Touching or stroking of tarsiers is prohibited as it may scare them. Their peace is carefully guarded. I must admit that to notice a tiny tarsier sitting in palm leaves or branches of a tree, is not so easy ..
Philippine tarsiers are officially recognized as endangered species. Extinction of these animals is caused by a decrease of their natural habitats and natural enemies. If before they were snakes and owls, now joined by dogs and cats. 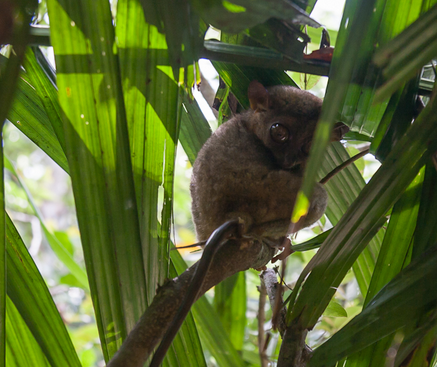 Contrary to the view that tarsiers are shy and defenseless, they are desperate and freedom-loving animals. Attempts to tame the tarsiers and make them pets were not successful and as a rule resulted in a death of the animal after a short time. Tarsiers can not get used to captivity, and in an attempt to escape, they often break their heads against the bars of cells. 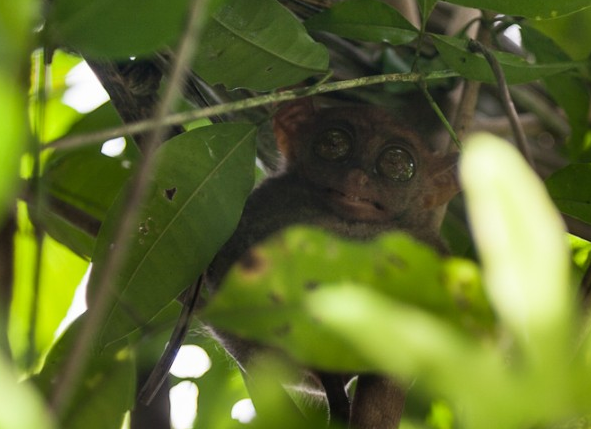 In the natural environment tarsier requires quite a large area – about one hectare. They are desperate to protect their territory. If they notice another tarsiers in their territory – a fight is inevitable. Often it leads to the death of the animals.